Summer is winding down in the states. We hope you had a wonderful summer, the Fall Equinox is around the corner. Our favorite time of year! 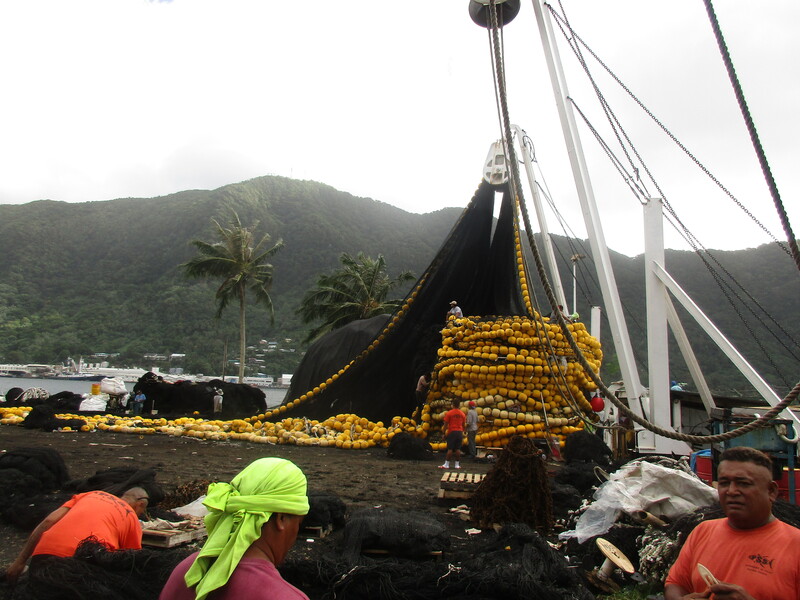 We’ve been asked the same question from our families and friends since we’ve been in American Samoa – “What’s Up?” We’ve had several passage plans written in the sand, completed the chart downloads and sent off the country applications only to be washed away by the ongoing waves. Fiji timing came and went, Tonga destination is still under consideration, waiting to see what the weather and the timing of the cyclone season brings us. So what else are we doing? Wellll, it’s pretty boring stuff working on the boat. 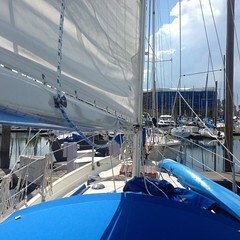 We’ve gone through the entire boat cleaning sails, lines, polishing the stainless steel, digging through lazarettes. Cleaning the mold growing on the cabin interior, drawers, shoes and clothing; the humidity here is 99%, just shy of dripping off the ceiling. Discarded galley items we deemed useless, moldy books, old ratty and new clothes that are too hot to wear, bits of this and that. It’s truly amazing we filled several boxes and hauled it off the boat. The goal is to be able to sleep in our v-berth while in port, the salon bed is pretty cozy for the two of us on a regular basis. We spent 3 days between cleaning the dinghy bottom covered with algae and fouled with nasty green growth, and re-sewing the chewed up dinghy chaps. We scraped and polished it back to new. The 3 year old 250’ anchor chain nearly corroded through a couple of links from using a stainless steel snubber hook, fortunately John caught that when we moved to the dock. Really bad news – it was in the middle of the chain. John cut out the rusty links and pounded in a joining link, took him about 2 hours in the hot sun on the dock using a ballpeen hammer and piece of steel. 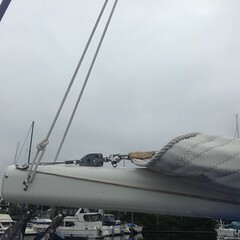 We used some bad advice cutting off 50’ of the new chain before we left Portland to reduce the bow weight. Next time we’ll bring a regular hammer too. 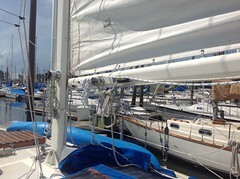 We purchased a lot of boat spares and routine maintenance items from home and had those delivered via USPS. And as always, one small routine maintenance turns out to be an add-on to some other issue that needs attention. 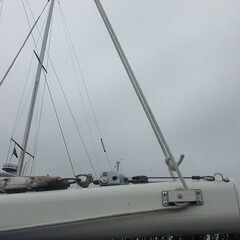 The electric bilge pump gave out, the raw waterpump couldn’t be fixed, and the new laptop wouldn’t boot, and 3 of the Renogy flexible solar panels stopped working, along with several other typical maintenance items that are necessary to maintain a great sailing boat. A lot of island time, swearing and ranting, head scratching, and a flattened wallet, all is now taken care of. and had one day of snorkeling and feasting at a famous place called Tisa’s. We enjoyed the traditional Samoan Umu roast during the August Sturgeon full moon. First the fire is built above ground, rocks are added, then layers of green banana leaves are laid on top. The meat and fish are wrapped in banana leaves, layers of taro root, pumpkin squash, and bananas are added; tuna and octopus roasted in husked coconut shells, with more layers of leaves and left to steam for several hours. Great food and fun with other cruisers. John installed a cockpit table, it is wonderful to sit outside and eat at a table or work on the computers. It swivels 360 degrees on a swing arm and has adjustable height. 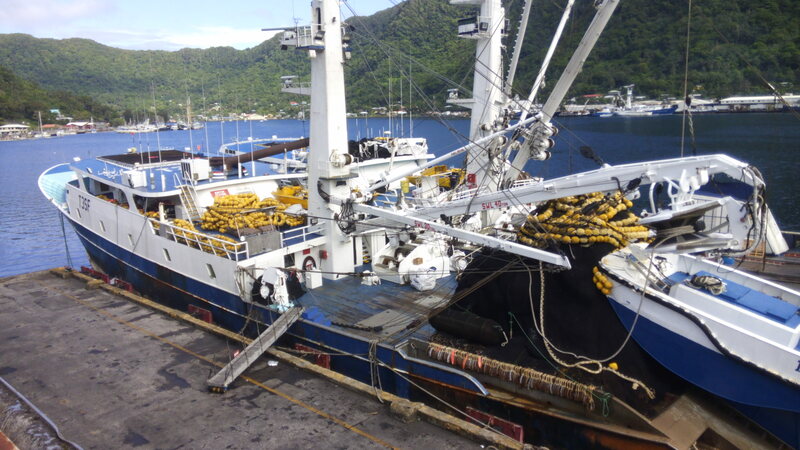 We purchased the same Lagun swivel arm and bracket mount that our friends on SV Sababa has. Thanks Tim and Lindsey for the great idea! The table is removable when underway. Am Sam is a wonderful relaxing place to hang out, and the term “island time” really originated from this place. The family owned buses are on their own schedule, the food comes out when it is finally ready (and cold), even the airport is laid back. People are in no rush to be anywhere in particular. There are several unpleasant facets to this island. I’m on my soapbox now. Trash is one of the biggest complaints. They just don’t seem to care enough. Styrofoam containers are used on top of serving plates, plastic utensils and cups are used – there isn’t a water shortage for cleaning, they just like the disposable system. The wind blows it all away. The portion sizes are mind boggling! I asked for a $3.50 sundae, I got nearly a quart of ice cream topped with chocolate syrup, cherries, and whipped cream all overflowing from the container. Of course it was served in a Styrofoam container on a plate layered with waxed paper. We stopped for a “quick” burger lunch the other day. A giant bun, ½ pound of meat, cheese, no lettuce available, large portion of crispy fires, a large scoop of macaroni salad and a coke. I overstuffed myself with 1/3 of the lunch. “Skinny Pelangy” (pelangy means white person) as John has been called by several people did manage to eat his entire meal but he needs to eat. The lady next to us ate her entire meal and shouldn’t have. It’s no wonder these people have the highest obesity rate in the world as they continue to gorge and enlarge; and they’re on our healthcare system! PUT DOWN THAT DAMN FORK! The poor kids are built like little building blocks with bags of chips and soft drinks glued to their sides. Boycott McDonalds, Carl’s Jr, Coke, Pepsi, and any other junk food producers. Tax the hell out of junk food. If it wasn’t for the humidity, lousy anchorage and bugs, and expensive commute back to the states, we’d consider calling Am Samoa home 4 months out of the year. 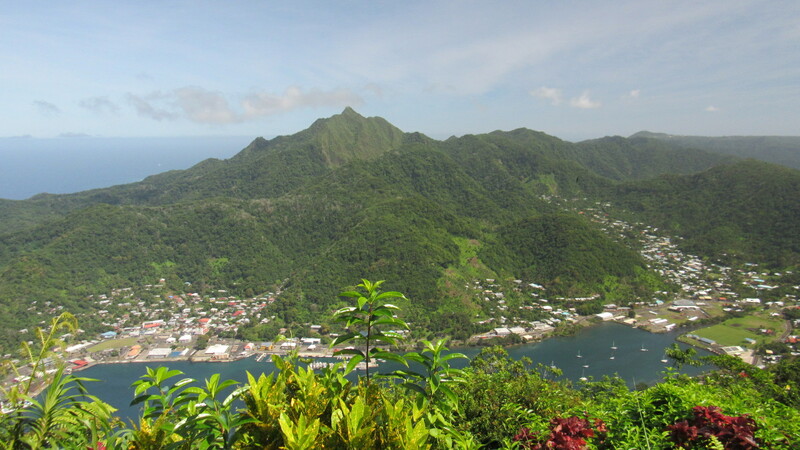 We enjoy the beautiful island and friendly community, the bus system, hiking, and limited shopping. 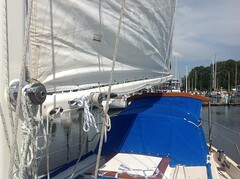 The timing of our projects and washed away sailing plans all worked out though. Our son is getting married in Maui this week so we flew in yesterday. It’s a nice vacation sitting here in the rented air conditioned condo with a comfy couch, king bed that doesn’t roll from side to side, 2 bathrooms with lots of hot water, a regular oven, full size upright refrigerator with ice cubes pouring out, and neighbors who knocked on our door to hand over 3 bags of food including a large bottle of vodka. We’re taking advantage of the fast-fast wifi to update the new computer, complete more downloads of the North Pacific region for our upcoming journey. Wonder if we’ll make Tonga, we’ll keep you posted. I promise!